Pam Whitehead has made an enormous contribution to the club over many years – as a regular member of the A team, as chair of the club last year, and club coach until two years ago bringing on young members such as Tom Horsfall and Chloe Robinson, but on Friday September 28 she went further than ever before. 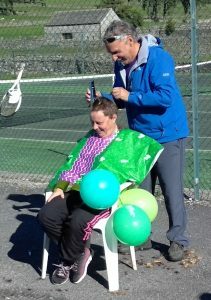 In front of the club house and with a dozen or more Mon Fris looking on Pam braved the shave, sacrificing most of her hair in support of the Macmillan Cancer charity. Club member Anthony Klej wielded the scissors and clippers with great skill to leave Pam shorn but with just enough hair left to avoid the need for a wig – and her ears remained in tact too. The hair raising event was the highlight of the club’s contribution to the annual Macmillan world’s biggest coffee morning and to date we have raised more than £250 for Macmillan’s with more promised. Thanks are due one again to Rod and Veronica Meredith for organising the event.